Mindfulness is a state of being totally aware of what is happening inside and outside ourselves, second by second. It is the state of being mindful. In other words, being in a nonjudgmental state of complete or heightened awareness of our thoughts, emotions, and experiences. That awareness is on a moment-to-moment basis, i.e., on what is happening now. As a modern, Western practice, mindfulness is founded on Zen and modern Vipassana. The Vipassana movement is a branch of modern Burmese Theravāda Buddhism. 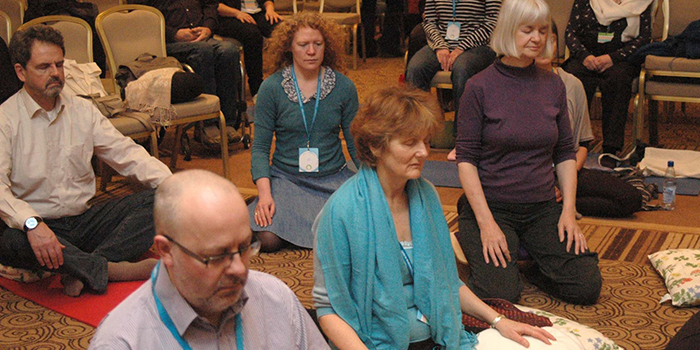 Prof. Williams is also a Founding Director and Honorary Senior Research Fellow at the Oxford Mindfulness Centre. Prof. Williams says that mindfulness also includes allowing ourselves to see the present moment more clearly. When we can do that, it can have a positive effect on how we see our lives and ourselves. The UK’s NHS says that becoming more aware of the present moment can help people enjoy the world around them. It can also help them understand themselves better. NHS stands for National Health Service. When you become more aware of the present moment, you start to experience afresh things that you had previously taken for granted. Mindfulness also allows you to become more aware of the continuous flow of feelings and thoughts that you experience. It allows you to see how we can all become entangled in that stream. Often, becoming entrangled occurs in unhelpful ways. You can then stand back from your thoughts and begin to see their patterns. It is possible to train yourself to be aware of when your thoughts are taking over. You also become aware that thoughts are just ‘mental events.’ Those thoughts do not have to control you. Prof. Christiane Spitzmueller, from the University of Geneva, says that employees who feel they are not in control of their work, can replenish their resources by practicing mindfulness. NICE (National Institute for Health and Care Excellence) is an executive non-departmental public body of the UK’s Department of Health. It publishes health guidelines. You can do this exercise either sitting down or standing up. In fact, you can do it pretty much anywhere you like at any time. Follow your in-breath mentally from start to finish. If it lasts four seconds, your mindfulness will therefore be four seconds long. Do the same when you breathe out. It does not matter how long your short each breath is. What matters is that you are 100% mindful of them all the time. If you concentrate, your breathing will probably naturally slow down and become deeper. You become your in-and-out breaths. Be aware of your body during your in-and-out breaths. During each breath, focus on your body’s existence and that it is there. As you bring your mind back to your body, they fuse and become one reality. At this point, you are much more aware of the here and now. When you are completely aware of your body, you will sense some stress, i.e., pain and tension, in your body. The pain and tension may have been building up over the years. While your body suffers, your mind has not been in the right place to help get rid of it. It is important to know how to release that tension. You can do this anywhere if you have a moment. Go through the first three steps mentioned above and then release the tension. With walking meditation, you should just let it happen. You do not need to make any effort. Enjoy each step as you move forward.